My favorite Christmas morning tradition is opening stockings with all of my family next to a blazing fire and a beautifully lit tree on Christmas morning. When my siblings and I were little, we would hand out everyone’s stockings so we could all open them at the same time. There is something exciting about stocking stuffers. 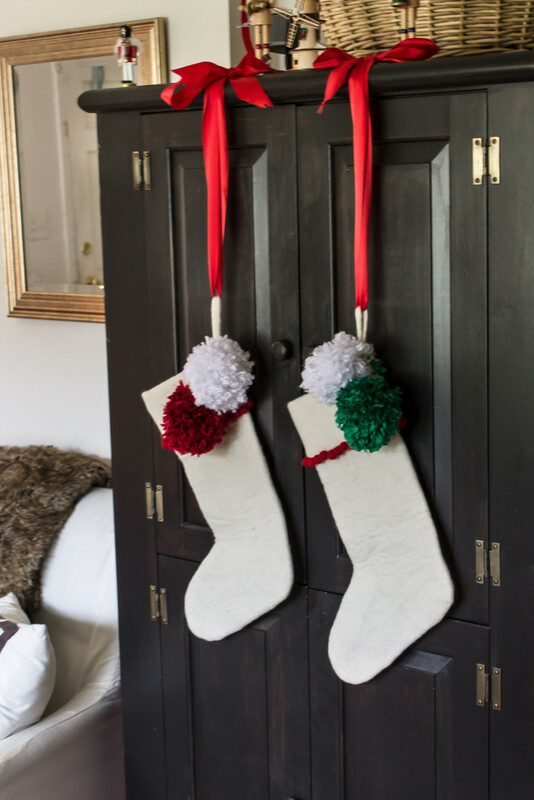 There are so many options that you can fit in a stocking and it is always exciting to see the fun little items that fill all of the nooks and crannys. As usual, stocking stuffers are the last things I think of when I’m Christmas shopping so I still have plenty to get. 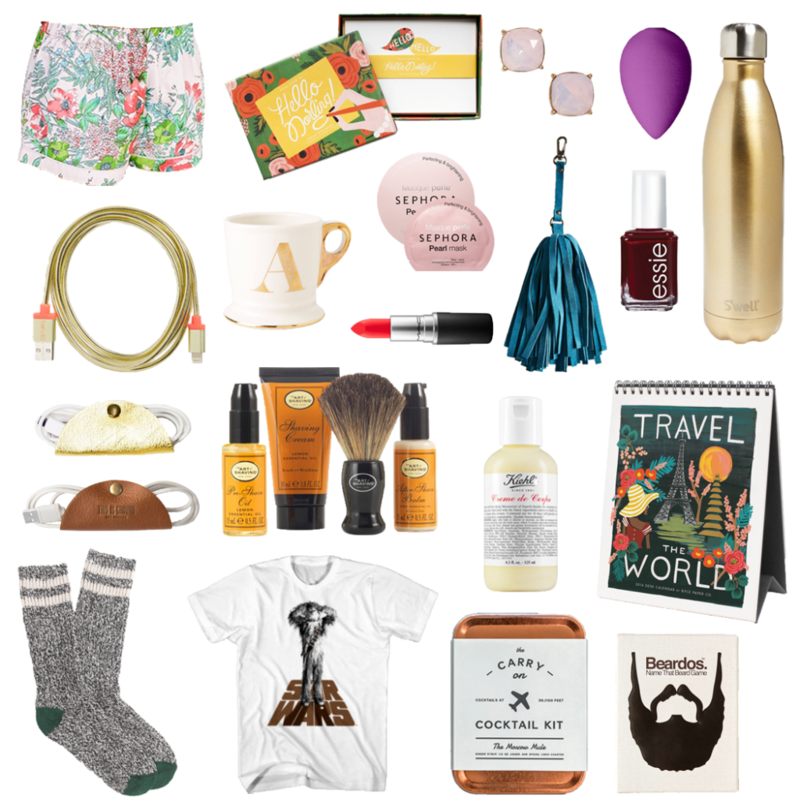 I’ve rounded up some stocking stuffers that you can grab before Christmas below – and the best part, they are all less than $35! I think it is so fun to get beauty products in my stocking. It’s like a little treat that you don’t have to justify at all. Nail polish, lipstick, the beauty blender (which I have only heard raves about! ), face mask and lotion are all the perfect little beauty items to fit in a stocking and pamper the recipient. Do you know a gold lover or a glam gal? There are so many great gold gifts out there right now! This gold USB cord and cord taco are so fun, and actually practical (I know I’m not the only one who loses my cords and finds them tangled in my bags). The gold Swell bottle is so cute and, like I mentioned in the Gift Guide for Him post, it is so well made. If you are looking to have a hot drink, this gold monogrammed mug is cute, popular and on super sale right now (only $7.50!)! I have one and it makes me happy every time I use it. Get one for your stockings before it’s gone! For the guys (why are they so difficult? ), socks always make a great stocking stuffer. With the recent release of the new Star Wars movie, I’m not below grabbing movie related paraphernalia. This is one of my favorite Star Wars shirts out there right now. When he’s not wearing a t-shirt, this shaving kit is a great little way for him to stay well-trimmed. My brother has it and not only is it great when you use it, it also looks nice in the bathroom. Win-win. Speaking of facial hair, this Beardos game looks hilarious. Card games are one of the best stocking stuffers because you get a fun small item that you can then play with all of the family later in the day. I’ve linked even more ideas below! What do you love getting in your stockings?